Hamilton Beach microwaves are very popular because they provide good cooking results and they come at reasonable prices. 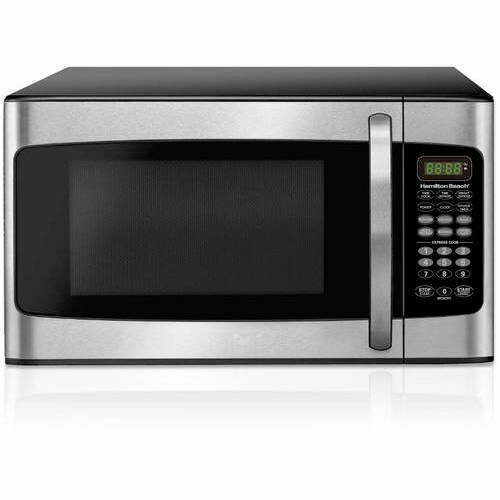 If you are looking for a powerful microwave oven, please check Hamilton Beach 1.1 Cu, Ft. Stainless Steel Microwave. The Hamilton Beach microwave comes with 1000 watts of microwave power that delivers very impressive microwaving performance. It has non-stick interior that is very easy to clean inside and out. Further, the Hamilton Beach microwave oven requires very less space on your counter, and it will surely match your modern kitchen décor. Hamilton Beach microwave oven has 1.1 cu. ft. capacity, ten power levels, six quick-set menu buttons, a kitchen timer, child lock-out option, weight and time defrost and LED display. This 1000 watts Hamilton Beach microwave oven comes with black housing and white painted cavity with one year of limited warranty. It comes in stainless steel, red, white and black colors to choose from. You can choose a color based on your preference. The Hamilton Beach 1.1 cu. ft. microwave oven is good for defrosting and it is perfect for busy families. It can good heating capability to defrost your preferred frozen food.